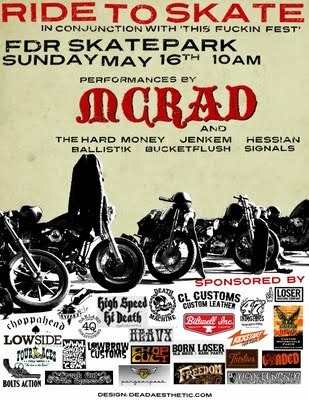 That's right here's another Ride to Skate for all you guys to find a cheap excuse to miss. I'll be there for the 4th time enjoying awesome tacos and coffee, watching pro skaters rip the park up with no hype, and checking out the best custom bikes in the area. And get this, the bike owners actually ride them! If you miss this one you're just dumb. I make these up once in a while for the local tattoo guys. The heavy base is sand or lead filled. It raises and lowers smoothly and easily. The top pivots 180 degrees and it swivels 360 degrees too. The wide base fits around those fancy barber chairs so the customer and the artist can be totally comfy. Did this Evo Sportster hardtail yesterday. It's a Leadsled Customs tail section. Looks like it's gonna make for a nice bike. Just got to get the front shortened up a bit. Another old frame will live. BSA restoration. Here's a 1955 BSA factory dirt track frame we were asked to restore. you will see there was a few pieces missing. We bent new rails, pressed in an oil pump loop, fabricated all the motor mounts, seat mount, seat post pieces, and repaired a bunch of little spots too. Quite a difference. The newest issues of Dice and Greay Kulture are here! Get with the times man. Read what the bike builders are reading and be on the cutting edge of the scene. In stock for you to pick up or I can mail them out. Multiple issue discounts available. We stock back issues of both mags. Call or email for availability and payment info. I was given a design to build a triumph headlamp bracket. Some machine work and welding and this is the result. I think it's pretty cool. Once it's topped off with the vintage Unity spot light I think it will be just freakin' awesome. Been working on this one for a while. There's something about this bike that makes me think it likes it here. No matter how many times I try to make progress it just seems like it moves backwards. Hoping that posting about it wakes it up a bit and it finishes itself. HAHA. Anyway, paint is by Ryzart. Can you dig it?